Art Program with Annie Painter Begins! 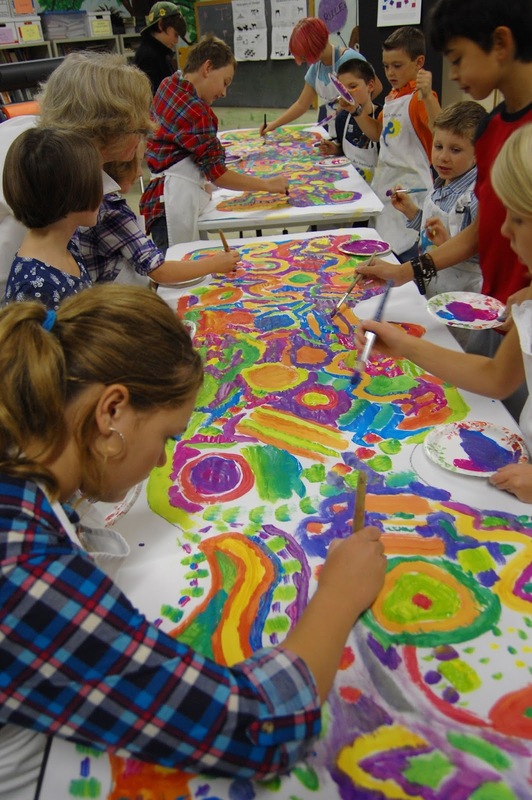 Black Butte School students had a fantastic morning as they worked together to create an abstract painting in their first art class. 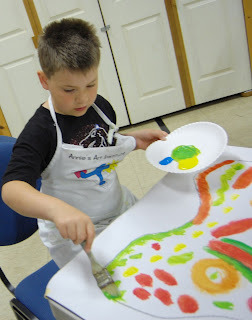 Students explored color and design by mixing colors and painting unrealistic designs freely. This method allows students to learn basic art skills without worrying about getting it 'right.' 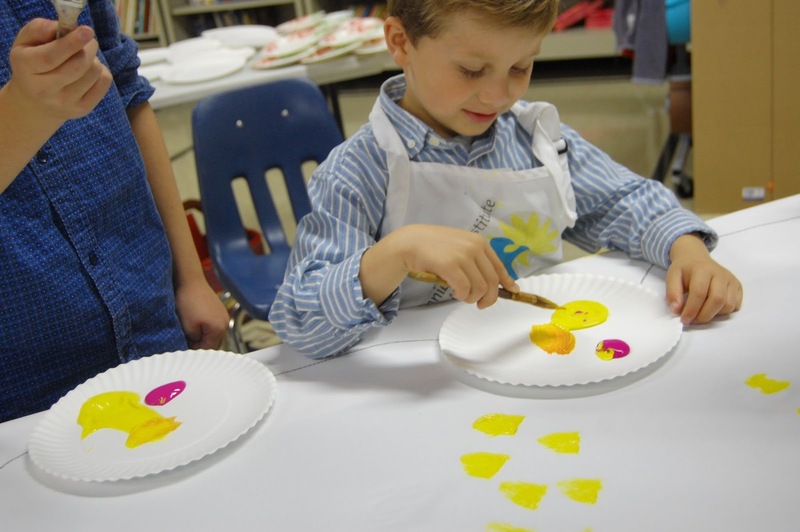 One student described his experience, "when I had different emotions, I changed the color." Another said, "I was just doing it!" BBS students are lucky to have Annie to help them develop art skills and enhance their creativity 2-3 days per month throughout the year. 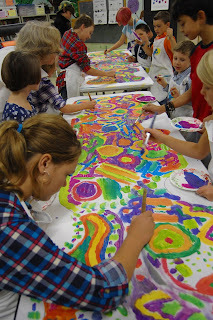 Anne plans to first teach students basic art and design skills, such as colors, moods, design principles, and form. Once students have a solid grasp of these, they will begin to combine art with their field studies themes. For example, students will learn how to create scientific botanical drawings through nature observation and design their dream community using only natural materials. Student work will be installed school-wide for the community to enjoy and will be organized so each child has a portfolio of work. winning Oregon elementary principal with experience as an elementary classroom teacher (K-6), and high school fine arts teacher. She spent three years as a national arts and literacy coach and has taught more than 3000 teachers through her graduate courses and workshops. Annie continues consulting and teaching through Portland State University from her studio and homes in Sisters and Portland. Annie's teaching videos can be found on YouTube and at www.anniepainter.com Black Butte School is so fortunate to have Annie as a part of our community! On Friday, September 18 2015, the Black Butte School went to Skylight Cave. After a short walk and a look down the holes in the ground that light up the cave (hence the name Skylight Cave), we met up with a US Forest Service biologist named Julie who studies bats. She told us about white-nose syndrome, a disease that kills bats by waking them up. A bat waking up takes 30 minutes and uses a lot of energy. Then they start wasting more energy to clean themselves. Did I mention it usually happens in the middle of winter when there isn’t a lot of food? We also learned about different types of bats and where they live. There are tons of bats! After the talk we geared up with head lamps and helmets and began the adventure. The first thing we had to do was climb down a ladder. The kindergarteners (Mia and Zion) went first followed by the rest of us. When we all got down, we went to see the skylights and what I call the tomb (it really looks like a tomb from Lord Of The Rings). Also, there is this amazing “sun clock.” It is a ray of sunlight that moves with the rotation of the Earth! We also saw a bat. Then we went to the caved part. It had tons of strange fungi and little worms. We saw another bat and experienced complete darkness. All in all it was fun!!! BBS is in the news! A new buzzword in education these days is STEAM: Science, Technology, Engineering, Art and Math. Emphasis on pulling those elements together is regarded by many experts to be what 21st century kids - and the economy - need. Students need math and science skills, but also need creativity in order to spur real innovation in current and future industries. 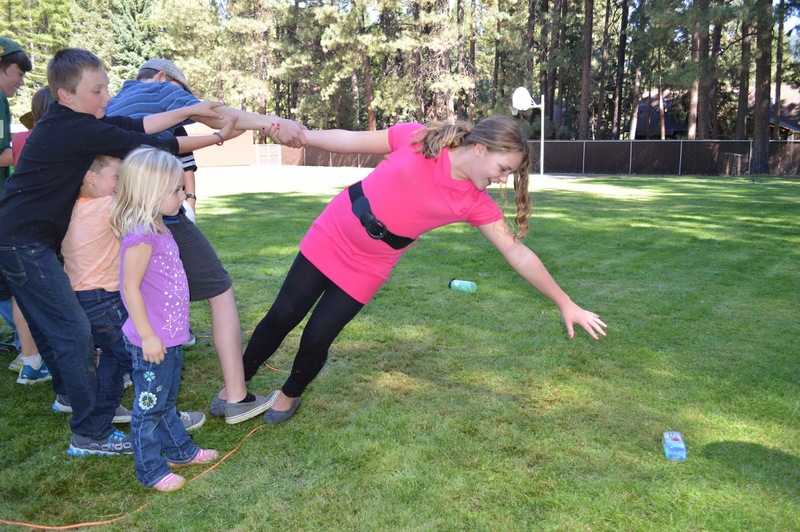 Leaders at Black Butte School (BBS) have redesigned the school's curriculum, schedule, and staff in order to accommodate authentic STEAM education. In a move designed to further strengthen its science and technology curriculum, BBS has hired Judy Craig as the school's first STEM (Science, Technology, Engineering and Math) teacher. "My job is to make sure that teachers weave the sciences and math all together so that they are not treated as separate subjects," said Craig, who taught for nearly 30 years in the Albany School District. Craig said the classes she is now teaching at BBS are a "good fit" with her past experience. She taught "all of the subjects, including PE" at mostly tiny schools in the Albany district, adding that "the whole realm of the environment and forestry and being a community on the Willamette River allowed us to do a lot of studies on the water and the animals and the land around it." In her part-time position at BBS, Craig teaches math and engineering to the older students in first period and to the younger students in second. Students will work on engineering projects involving electricity (1.5-volt batteries), trees (taking their measurements) and popsicle sticks and plywood. "We'll build bridges and see how much force it takes to break them," Craig said. Craig, 65, joins Delaney Sharp, BBS's new head teacher, and Ethan Barrons, an eight-year veteran of the Camp Sherman-based school to complete the core faculty. Together, they plan to institute a curriculum that blends classroom instruction with field studies and arts programming. A visual arts program at BBS is headed by Annie Painter, a Sisters and Portland native. Painter is well known throughout the state as both an incredible art teacher and arts-education advocate. Her art classes will blend visual arts with science lessons learned through the classroom and field studies courses - STEAM education in practice. The field studies program at BBS is interdisciplinary and includes periodic full-day field expeditions. This month, said Sharp, students are scheduled to hike Black Butte, explore Skylight Cave, and camp out overnight on the Metolius. "We will be partnering with the Forest Service to study bats and we will be building bat houses as part of a national effort to boost bat populations," Sharp said. 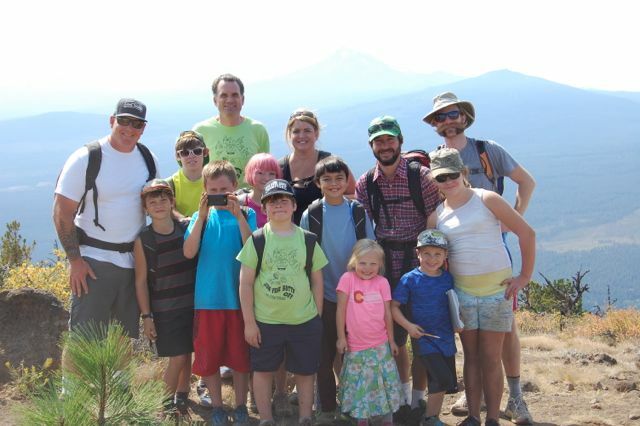 The hike up Black Butte was challenging for some (especially the two new kindergartners), but was a perfect way to help students establish their sense of place in the Metolius Basin. This year students will also work with the Forest Service to study fire ecology, monitoring Glaze Meadow before and after a prescribed burn to determine its effects on plants and animals. This winter, Sharp said the school and the Upper Deschutes Watershed Council will study and help restore Whychus Creek. The STEAM curriculum at BBS this fall will also include a performing arts class, in which students will learn music and theater basics to prepare them for the winter performance. This class will help students build confidence and creativity as they apply music concepts to math lessons and theater to science and language arts. The historic Black Butte School serves students, grades K-8, in Camp Sherman as well as Sisters. For further information visit www.blackbutte.k12.or.us, or contact Delaney Sharp, head teacher, atdsharp@blackbutte.k12.or.us. We started out our annual hike up Black Butte with a little inspiration from Louis L'Amour to always remember that, "the trail is the thing. Travel too fast, and you will miss all you are traveling for." Along the 2 miles and 1,600 feet up the old volcano we stopped to look at aspen, laugh at squirrels, take needed rest breaks and photos, and get a sense for our place in the Metoluis basin. We made it to the top in time to eat lunch and enjoy a spectacular view. We saw the winding Metoluis River, the wet meadows of Black Butte Ranch, and our home town of Camp Sherman. and our knowledge of Black Butte helped us to gain a better understanding of how we are connected to this place. Before we headed down, we recorded our thoughts in our field journals. One of our new students commented that, "this was like the funnest day of school I've ever had." We are looking forward to more fun field expeditions, including our next one to Skylight Cave where we will learn about bats. First Day of School 2015-2016! The first day of the 2015-2016 school year at Black Butte School was a rousing success! The beautiful, sunny, warm September weather set a perfect backdrop for the many outdoor activities students experienced. One of the main goals of the first day was to begin building a tight trusting community that will support everyone as the year progresses. 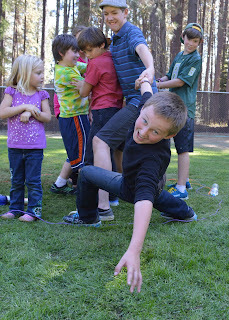 In the afternoon, students were challenged with a variety of team building games. They worked together, with older students helping younger students and everyone smiling the whole time. 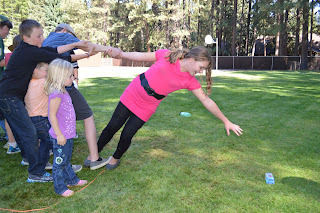 The photos show the students working together to beat the game "shark island," the culminating and most challenging game of the day. 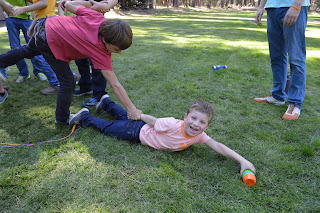 Students had to stay on the "island" (inside the rope circle) and "save" their own "floating" water bottles from the sharks lurking in the "water," without touching the water itself. They came up with a plan, executed, and triumphed. The best part was at the end when everyone gave high fives and cheered when all the bottles were saved from the sharks. With all this positive energy on the first day, this school year is sure to be one of the best ever!